Today, 26th September 2016, Justice John Tsoho stepped down from presiding over the case between Nigerian government and the leader of the Indigenous People of Biafra IPOB, director of radio Biafra and Biafra TV; Nnamdi Kanu. After the counsels of Nnamdi Kanu and the other two defendants insisted that he must hands off the case, stating that their clients do not have confidence in his court because he is biased. It will be recalled that Justice John Tsoho had earlier stated that he will continue to preside over the case till the end. The question is; why is he stepping down now? Why did he not persist? He was quoted today in the court as saying “Even if I am cleared of any bias by the NJC, I will not continue with this case,” Is he already afraid or what? RELATED ARTICLE: BIAFRA: NIGERIAN JUDICIARY DRAGGED TO THE MUD AS NNAMDI KANU'S DEFENCE TEAM MUSCLES JUSTICE TSOHO OUT OF CASE. 1. 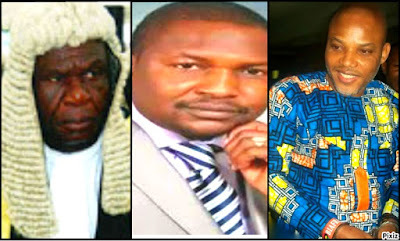 Justice John Tsoho has been delaying justice for Nnamdi Kanu. He has been on this case for about nine months and has only achieved perversion of justice with his bias mind, playing the script of his paymaster. 2. He denied Nnamdi Kanu bail with baseless reasons and remanded him with the other two defendants in Kuje prison, even when he knows that Hon. Justice Ademola granted him (Nnamdi Kanu) unconditional release, after Magistrate Court, Wuse 11 granted him bail. 3. He entertained an application written on a piece of paper from the DSS without following the due process of the court on appeal. 4. He reversed his previous ruling against secret trial and mask witness and turn to say that Nnamdi Kanu will be tried in the secret with masked and screened witnesses. Now he has stepped down. If he thinks that he will go scot free after being so unprofessional and wicked, he should think again. The Attorney general of Nigeria (AGF); Hon. Justice Abubakar Malami (SAN), and the Chief Justice of Nigeria (CJN), The Hon. Justice Mahmud Mohammed should ensure that Justice Tsoho is sacked if he fails to resign with immediate effect for smearing the Nigerian Judiciary with an indelible mark of unprofessionalism. John Tsoho gave the world a black image of Nigerian judiciary, he made the world believe that Nigerian judiciary is not independent of the influence of the executive arm the government led by Muhammadu Buhari. But this can be corrected; the image of Nigerian judiciary can be redeemed by the attorney general of the federation, by sacking John Tsoho. READ TOO: BIAFRA: NIGERIA STOOD STILL FOR BIAFRA AS FREE NNAMDI KANU CAMPAIGN CONTINUES TO MAKE WAVE ALL OVER THE WORLD: WE ARE UNSTOPPABLE! Sacking John Tsoho will tell the world that Nigerian judiciary does not tolerate incompetent, unprofessional, and bias judges. The attorney general must understand that if Justice Tsoho is allowed to continue as a judge, he will continue his rascality and wickedness on Nigerians and corrupt other judges like a virus. Justice John Tsoho must be dismissed if the Nigerian judiciary is to redeem its already tarnished image.